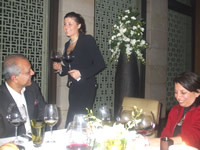 Brindco Ltd., importers of Gaja wines in India, organised a winemaker dinner last Saturday at the Hotel Aman, Delhi during the short visit of Gaia Gaja, daughter of Angelo Gaja and the exporter manager of the iconic producer from Barbaresco in Piedmont. Subhash Arora reports. Gaja might be one of the most revered and iconic producers of Piemonte but his elder daughter Gaia Gaja who looks after the export business, stole the thunder with her passion, innocent charm and effervescence, whether talking about the wines presented, her village or the winery, at the dinner hosted by Brindco and Hotel Aman last Saturday for a select group of invitees that included Mani Shankar Iyenger, Dr. Navin Rao, Asian head of Merck and several other wine connoisseurs. Each one of the persons attending the dinner felt very comfortable sharing thier experience not only about the wines of the evening but also about the region. People also talked about their general impression about Gaja wines and dinners or events where they might have come across these wines or simply enjoyed sharing their experiences with wine in general with Gaia. 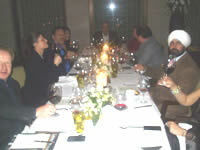 After a couple of glasses of Pommery Champagne under their belts, the guests were escorted for the sit-down dinner to the Lodhi, the signature restaurant for such events. The Rossj- Bass 2007, a Chardonnay (Gaja was the first one to plant this international varietal in 1979 in Piemonte, Gaia informed us) named after her younger sister Rossana, made in Burgundy style with a touch of oak giving it a good balance and an ageing potential of 5-7 years. It was easy drinking and yet a complex wine. Gaia’s advice to leave some to appreciate the evolution in the glass could not be taken seriously, if only because it took minutes to polish off the wine that matched the Mozzarella dish well. Barbaresco 2004 was a perfect pair with the partridge made with port reduction (why not with barbaresco or at least a Nebbiolo, I wondered). The initial attack on the nose was that of white truffles, so famous from these parts of Italy. Roses were in the back layer but more predominant. The ripe berry flavours with tannins that were suitably tamed in the 5-year period of barrique/botte/bottle aging, were seductive. The balance of this wine and the persistent on the palate was as commendable as its elegance. Gaia explained that Barbaresco had been under the shadow as a younger brother to the neighbouring Barolo till a few decades ago despite being about 10 kms from each other and having similar quality of Nebbiolo grapes. It appeared more feminine and seductive than the powerful Barolo that followed, a Barolo Dagromis 2004. I found the Barolo a bit confounding. I was under the impression that Angelo’s father’s love, pride and passion for Nebbiolo and Barbaresco had made the family abandon the Barolo wines in the nineteen sixties, making Barbaresco the flagship wine. But Gaia clarified that in 1998 the family decided to bring out Barolo made from the grapes of the younger vines of Serralunga and Conteisa that the family owned in the classified communes of Barolo. Explaining further, Gaia said that the label had been designed especially for this wine which had been introduced because of significant demand. A special aspect of Gaja is reflected in the vision of her grandfather Giovanni Gaja who decided in 1946 not to release wine from poor vintages like 2002, 1980 and 1972 and sell them as bulk wine to other producers instead. The tradition was carried forward by her father; there was no release of 2002, 1980 and 1972, for instance, she said. They use the grapes from the younger vines in the Gromis she said. At about a third of the price of the flagship Barbaresco, this will decidedly be the Gaja Barolo to watch for in the Indian market, with all the nuances of a top Nebbiolo and the label of Barolo helping in the brand recognition. The wine was a perfect match for the Risotto and the braised duck. The last wine of the evening, Ca’Marcanda Magari 2006 was the Bordeaux blend of Cabernet Sauvignon, Merlot and Cabernet Franc from the Ca’Marcanda winery Angelo Gaja bought in 1996 in Bolgheri in the western coast of Tuscany, already known for Super Tuscans like Sassicaia, Orenellaia and Solaia. The wine is a classic match for the rack of lamb which has become such a staple dish in all fine dining restaurants that one’s thoughts drifted to several other restaurants where it is more delicious and palatable. While presenting Grappa di Barolo-by now most people ought to be aware that the Grappa is made from the distillation and maturing of the leftovers of the pips and skins of the juice and is closest in comparison to brandy that includes Cognac and Armagnac. In a lighter vein, Gaia said that Grappa was classified as ‘Crappa’ ( I must remember that for future reference as I am not madly in love with the high alcohol distilled product, which was nonetheless highly perfumed). She gave out a good tip to judge whether the grappa was of good quality and dry. Take a drop on your palm and rub both hands till the alcohol evaporates. Taking the clasped palms to the nose, smell the perfume and tell the quality of the Grappa- a sticky impression left on the palm would indicate that sugar had been added to it. I also discovered a safe way to sanitize hands after dinner to avoid swine-flu! Earlier, Mr. Henry Gray, the new General Manager of Hotel Aman New Delhi welcoming the guests said this was the first wine dinner they were hosting this year and he could think of no better wines than Gaja to have a wine dinner with. Olmo Fernandez, the Lodhi manager and his staff handled the proceedings with business-like efficiency. Of the wine service - proffered in the beautiful Riedel stemware, Gaia said the wines were served at the perfect temperature and were decanted perfectly-two hours for reds and back into the bottle for the perfect way of serving. She also recommended a little breathing for their whites. 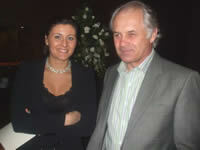 Arrivederci Gaia Gaja- till your next annual visit!